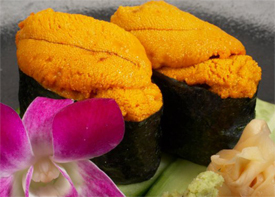 I know I’m late to the party on this one but I tried uni, sea urchin, last night and I had to tell someone about it! For those of you that know me, I’m not too fond of strong seafood tastes. But I reached a point where I am tired of hearing about uni and not having a flavour reference. It’s everywhere; on TV, magazines, foodies blabbing on about it (..I guess that’s me now too..), and in cookbooks. After my experience at a local sushi restaurant where I live (http://www.senzushi.com/), I did some research to find out what I really ate. Check out the Uni Diaries to set the record straight (https://theunidiaries.com/2015/11/15/what-is-uni-sea-urchin-101/)! I’d heard uni described as a bunch of things, but none of the descriptions made me want to try it. In my head, I had built up this idea that it was fishy and intense, but now after having it, I can say it’s quite the opposite. I saw uni on the feature sheet and asked the server if it was fresh and local, and she assured me it was. I had a good feeling about it because uni is not usually on the menu and she said this is the season for it. Somehow that calmed my nerves, because fresh usually means less fishy tasting. The little nigiri of uni arrived, wrapped in seaweed just like the picture above, with a few mini pieces of cucumber. I tore a small edge away from the uni with my chopsticks and put it in my mouth…and waited for it to hit me. It didn’t hit me over the head with intense fishiness, it was subtle and I was speechless. I didn’t know how to describe it, and God knows I’m never short on words. I put the rest of the uni in my mouth and chewed around and experienced it slowly. It was creamy, it melted away, like the softest of custards. It wasn’t slimy but it definitely had moisture. The aftertaste stayed with me for a few minutes. It tasted like saltwater. Not the saltwater that gets up your nose and burns, but the essence of the sea, clean tasting and mild. It lingered in the most unoffensive of ways. It’s odd because I live on the West Coast of Canada and there are no shortage of sea urchins, but I have a hunch that like most delicious cash crops, they get shipped overseas. It’s rare to see it on the menu of a lot of restaurants, but high quality sushi restaurants are usually a safe bet. I look forward to my next uni experience. “Creamy ocean” Or “Foie gras with salt water” are probably the best way I could describe it. Thanks for entertaining my uni rant! Next Pie contest! Win a pie and Ice Cream made by TheSimmeringPot!